In this blog, I will be shooting from the hip. While I use illustrations to make my point, I do not make definitive arguments other than to say I have been going on about these things for a long time and have blogged about my strongly held views and will enter the arena again if need be, fighting with facts. I think people need to be woken up that there is a problem and that is what I try to do. But firstly, some definitions; all popped up as the first hit when I did a Google search. 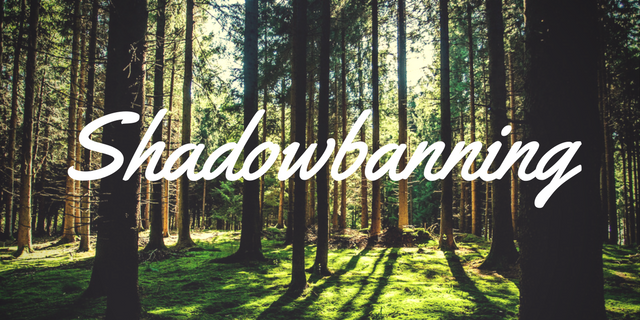 Shadow banning: (also called stealth banning, ghost banning or comment ghosting) is the act of blocking a user or their content from an online community such that it will not be readily apparent to the user that they have been banned. Free press: not controlled or restricted by government censorship in political or ideological matters. Free speech: the right to express any opinions without censorship or restraint. As one who regularly watches and listens to what is now described as alternative media, I often hear the complaint they have been banned and censored by the likes of Google (including YouTube), Facebook and Twitter for expressing views deemed by these service providers to be unacceptable, while other media putting forward what the alt media deem (and I am inclined to concur) as providing worse content are given a free pass. While some might argue they can ban/censor who they like, few will argue Google & co are the main gatekeepers to the Internet and it is difficult to operate effectively without their services. Others argue they are like utility providers and should serve all irrespective of views. It seems these gatekeepers are in cohorts with the liberal left and arrogantly shut down those who express views that are not approved by such. A more subtle way of stopping content being put forward is by shadow banning and no less a person than Donald Trump has experienced this with the result that many less people have been able to access his tweets. Again many in the alt media testify to similar treatment. The power these Internet gatekeepers have to shut down, acting as self appointed thought police, what they deem as unacceptable is to me unacceptable. Shadow banning is an insidious example. There is a certainly irony in that while alternative media, often seen as alt right, are being kicked off the likes of Google and co, the mainstream media, often seen to be as liberal left are being taken to task as being Fake News, including by yours truly and notably by POTUS. While it is one thing to have a bias, and for some of us that is abundantly evident by the spin it provides news and what it reports that is no big deal and what it fails to report, which is an even bigger deal, some would say the President is right. The outcry by their supporters is they are doing what the Free Press has always done and should continue to do, which is to bring the powerful to account and how dare he say otherwise. I watch these developments with interest and consternation, seeing similar concerns in the UK, except there is no Trump to harass them, and is why I am being increasingly turned away from the mainstream e.g. the Guardian and the BBC and being turned toward the alternative e.g. the Alex Jones show (which I also take with a pinch of salt). I believe honest journalists do exist but in a climate that does not encourage such. While I agree having a free press is a necessity for a free society, it needs to focus on providing truth and balance. Closely related to a free press is free speech. While unlike the US, the UK has no First Amendment guaranteeing free speech, common law would lead one to think we have it. The answer is yes we do and no we don’t. The many instances of people falling foul of officialdom for offering politically incorrect views on subjects like LGBT rights and Islam says to me that such does not exist. The disturbing case of Tommy Robinson who appears to be a focus on a concerted effort by a powerful elite to gag and Julian Assange being confined with an extradition order looming, when he has done us all a great favour by exposing the shenanigans of the US Deep State and other powerful elite elements, I find worrying. Sure, there needs to be some restrictions on free speech, the obvious one being on those who shout “fire” in a crowded building, but methinks too much goes on behind closed doors that we the people should be aware off, and that we are in grave danger of entering a paradigm (and have) where we can’t speak freely on those things that matter, when the power of the powerful can penalise us if we have the temerity to speak out. There you are – shot from the hip – think on it and discuss! Shadow banning???? I expect the Right Wing Press to be Pro Israel, and anti Palestine, also wanting to smear Jeremy Corbyn with antisemitism , but not the BBC!!!!. But it is. any opportunity they will put down JC, and the BBC will never criticize Israel, or make programs about The West Bank, Gaza, The Wall/Fence,Settlements stealing their land, cutting down of their olive trees, putting their children in prison. I could go on, but tell me the last time the BBC made any of these programs?